The new Viscomaster ( "Brookfield Type" ) viscometer is the ideal solution for performing precise viscosity measurements quickly and efficiently. Its ease of use and versatility enable it to be used in many industrial applications where the determination of fluid properties and behaviour is essential. The principle of measurement is simple , but reliable, based on the well established method of measuring the resistance of a spindle rotating in the sample under test. Measuring range - 100 to 13,000,000 cP. Fixed speeds from 0.3 to 200 rpm. Direct readout on clearly illuminated 4 line LCD displaying selected operating parameters. Senses and displays continuously:- Viscosity (cP or mPa·s) ; Temperature ( Degrees C or F) ; % scale (Brookfield) ; Speed (rpm) ; Spindle used. Progressive deceleration avoids excessive torque on spindle when stop is selected. 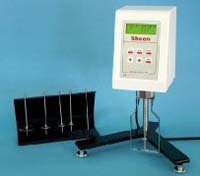 Temperature reading with platinum probe. Density input allowing kinematic viscosity determinations. Storage of 10 user-defined test settings.